Discover how to make our Angel Lush Recipe Your Way. This angel lush recipe helps you craft a perfect angel lush tailored to your needs. It covers making the dish in cake, parfait and individual forms. You'll have an angel lush for every occasion. Mix pineapple and dry pudding mix. Stir in COOL WHIP. Parfaits: Cube cake. 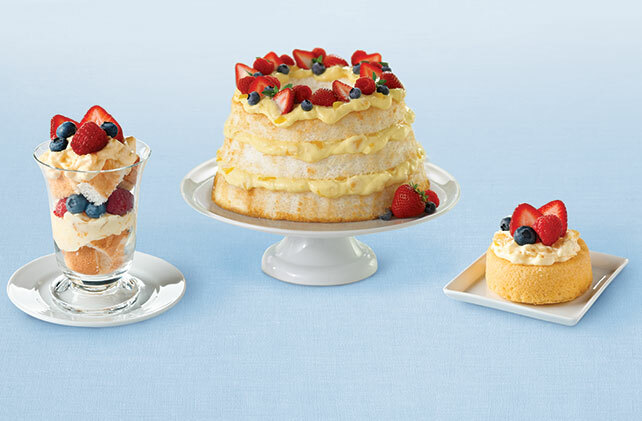 Layer in 12 parfait glasses alternately with filling and berries. Makes 12 servings. Cake: Cut cake into 3 layers. Stack on plate, spreading filling between layers and on top of cake. Top with berries. Makes 10 servings. Individuals: Spoon filling into dessert shells; top with berries. Makes 12 servings. Prepare using 1 pkg. (1 oz.) JELL-O Vanilla Flavor Sugar Free Fat Free Instant Pudding and COOL WHIP LITE Whipped Topping. Use toothpicks to mark cake into 3 layers. Use a serrated knife to cut cake, in sawing motion, into layers. Prepare using JELL-O Lemon Flavor Instant Pudding.